Hosting a traditional backyard barbeque is a great way to begin celebrating warm weather with friends, family and loved ones surrounding you. 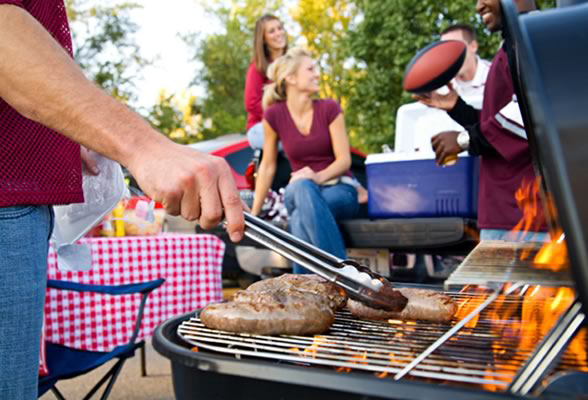 When you are planning a backyard barbeque on your own, there are a few things you should consider adding to your checklist to ensure your party is entirely flawless, regardless of the number of guests you plan to host. Offering a variety of barbeque foods is highly recommended if you have invited any guests you are picky or even those who are vegetarians. Offering different types of kebabs that are vegetarian and also include pork, beef, chicken and shrimp are all advisable if you want to offer the most variety possible at your next backyard gathering. Providing delicious desserts is not always necessary, but it helps to take care of any sweet tooth cravings your guests may have once they have finished the main courses. You can make something as amazing as some home-made ice cream with fresh fruit mixed in or some delicious brownies. Offering simple desserts such as sweet rolls, pie or homemade cake is essential for an authentic backyard barbeque atmosphere. Implementing different atmospheric decor is also highly recommended if you want to host a flawless backyard barbeque that feels authentic and genuine. Red and white checkered tablecloths, napkins and themed flowers and decor can truly bring the atmosphere to life regardless of where you currently live and the time of year you are planning your own barbeque. If you want to get a little more fancy you can explore the lounging furniture from www.designfurnishings.com/collection/tk-classics/bermuda/ to give your backyard barbeque a comfortable, relaxed feeling. Whether you enjoy tangy barbeque sauces, spicy sauces or even sweet sauces on your ribs, pork and chicken, giving your guests a selection of barbeque sauces to choose from with their food is one way to make your party even more memorable. Offer barbeque sauces in different bowls with ladles in addition to also including barbeque brushes for those who want to brush the sauce on the food they have selected individually. The more sauces you have to choose from, the more likely you are to satisfy all of your attendees. Another way to ensure your guests are enjoying themselves at your backyard barbeque is to provide them with an array of refreshments and beverages, both non-alcoholic and alcoholic. Creating variants of the classic backyard lemonade can go very far. Try mixing some sweet and condensed milk with vanilla to your favorite lemonade brand for some delicious Brazilian lemonade that everyone will be sure to love. You could also create some southern-based cocktails using bourbon, whiskey and scotch to bring the true atmosphere of a southern barbeque to your very own backyard. Knowing what to add to your next upcoming backyard barbeque event you plan should be something that you give more than just casual thought. There are plenty of great ways for you to ensure your guests enjoy themselves while bringing a genuine atmosphere of caring to your loved ones this summer.